A Roman Catholic Bishop from Texas, Joseph Strickland, called it a “scene from Hell.” He was referring to a video on social media showing New York state legislators giving a standing ovation at the passing of a new law, the Reproductive Health Act, which legalizes late term abortion. Pause for a moment and let that sink in. Lawmakers and their friends rising to their feet in rapturous applause because at last it’s legal, no holds barred, to kill your baby right up to the moment of birth. Unthinkable? Not in the Empire State, and you can watch the celebration live on Twitter. A scene from Hell indeed and reinforced by Governor Cuomo, a Roman Catholic, lighting up One World Trade Center to mark the victory. There it rose in the night, like a pinklit Moloch, looking down on Manhattan. A woman cannot call herself free who does not own and control her body. The key word here is free, a woman must be free from constraint, biological or otherwise. And there you have it, New York’s fanatical commitment to “reproductive rights” flows from an equally fanatical commitment to freedom perceived as total, radical autonomy. Or to put it simply, the ability to do what you like, when you like, without hindrance of any kind. This, it’s claimed, is a summum bonum, an absolute good to be pursued absolutely, and nothing should stand in its way. It follows, per Sanger, that a woman must be able to decide what she does with her own body, even to the point of killing a life within it. Anything less is an affront to her liberty, her self-determination, and it’s precisely this kind of freedom which was applauded in New York. The demons were doubtless cheering too. We find the same divine pattern reflected in child bearing and human existence writ large. The infant in the womb exists from and with his mother, while she exists for her child. Likewise adults, who can only exist successfully from, with, and for one another. In sum, we are in the image of God, and it’s exactly this which we’re being urged to erase. Be free, be gods, so kill your children if you choose and in that choice the essence of our existence, of selfhood and genuine freedom lived in relationship in the image of God. There is deep evil in this, a satanic revolt, at heart, against God and Man and abortion is its sacrament, the anti-sacrament of an idolatrous anti-god, the Devil. It is the outward expression of an inward and spiritual rebellion against all that’s good and true, a mother’s love for her child, our meaning and fulfillment as a community of persons, against God himself. With abortion, we find ourselves face to face with Lucifer’s primal rebellion against his Creator and creation itself, an insurrection taken up with revolutionary fanaticism by those who would be as gods here on earth, though they turn it to Hell in the doing. “Here at last [in Hell] / We shall be free,” proclaims Satan in Paradise Lost. As we go to press, New Mexico and Massachusetts have followed New York’s lead, with similar legislation proposed in some 10 other states. In Virginia, for example, a proposed bill introduced by Democrat delegate Kathy Tran would have legalized abortion up to and after birth. In the meanwhile, an estimated 3000 abortions take place in the US every day, subsidized to the tune of $500 million a year by the government, and all in the name of freedom. We would do well to remember that Carthage was destroyed utterly, not a stone remained standing. It is surely true that we too, as a nation, stand under the same judgement. In the words of the Apostle Paul, “Be not deceived; God is not mocked: for whatsoever a man soweth, that shall he also reap.” (Gal. 6:7) God will not be mocked and a people that sow in death will reap the same. Knowing this, Christians regardless of denomination or political affiliation, must stand boldly for life. The life of the unborn child, the life of humanity itself, and the life that’s to be found in the truth and freedom of the Gospel, the life of God offered to us in Christ. Fr. 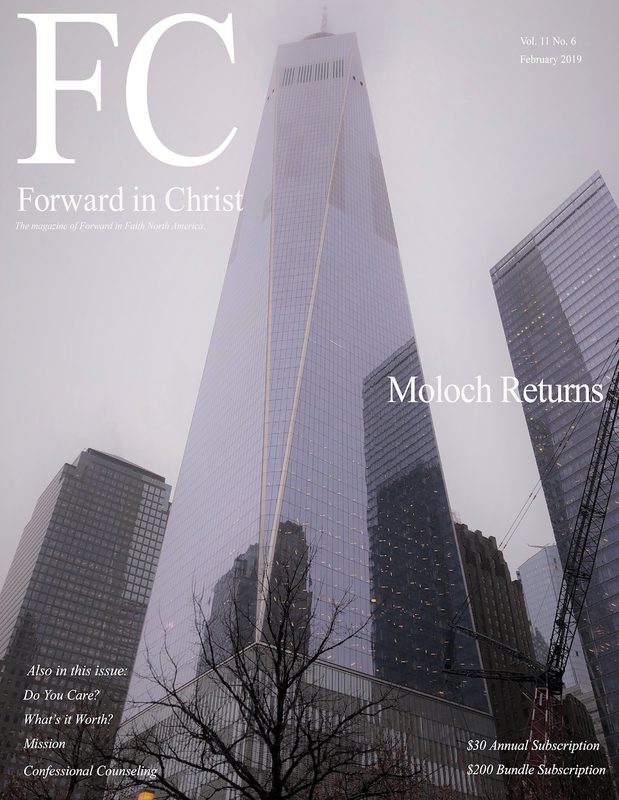 Michael Heidt is Editor of Forward in Christ magazine and a priest in the Diocese of Fort Worth.